For the football club, see West Ham United F.C., for the County Borough see County Borough of West Ham. For other uses, see West Ham (disambiguation). 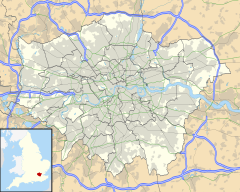 West Ham is a district in East London, located 6.1 mi (9.8 km) east of Charing Cross. The place name can apply to a large district forming the western part of the modern London Borough of Newham, or simply to the central locality of that district. Neither the wider nor the central district are current administrative units, although there is a West Ham electoral ward covering part of the central area. West Ham lies within the traditional boundaries of the county of Essex becoming part of the London Borough of Newham in 1965. West Ham was formed when the older territory of Ham was sub-divided in the 12th century. Originally a civil parish, and ultimately a county borough, West Ham was an administrative unit, with largely consistent boundaries, from the 12th century to the formation of Newham in 1965. The area lies immediately to the north of the River Thames and east of the River Lea. It includes the districts of Stratford, Plaistow, Canning Town, Silvertown and Custom House; while the districts of Forest Gate and Upton Park straddle Green Street and the other boundaries of West and East Ham. The central West Ham area lies in the centre-west of the wider district; its twin focuses are All Saints' Parish Church and West Ham station. The west of the central area is bounded by the River Lea and is an industrial\post-industrial neighbourhood downstream of the London Olympic Park. The east it is mostly residential, consisting of Victorian terraced housing interspersed with higher density post-war social housing. There are no major shopping areas. Bromley-by-Bow in Tower Hamlets lies to the west of the River Lea and in other directions lie neighbouring parts of the wider West Ham district: to the north and east the area bleeds into Stratford and Plaistow, with Canning Town to the south. West Ham station on Manor Road is served by the London Underground Jubilee, Hammersmith and City and District lines; the National Rail c2c services; and from 2010 the Docklands Light Railway. Plaistow and Stratford stations are also close by. The area has been one of the most deprived in the country and as part of the New Deal for Communities programme it forms, with neighbouring Plaistow, a regeneration area. A settlement in the area named Ham is first recorded as Hamme in an Anglo-Saxon charter of 958 and then in the 1086 Domesday Book as Hame. It is formed from Old English 'hamm' and means 'a dry area of land between rivers or marshland', referring to the location of the settlement within boundaries formed by the rivers Lea, Thames and Roding and their marshes. These natural boundaries suggest that Little Ilford and North Woolwich are likely to have been part of Ham(m). West Ham formed a large ancient parish of around 4,500 acres (18 km2) in the Becontree hundred of Essex. The parish was divided into three wards: Church-street, Stratford-Langthorne, and Plaistow. The parish also included the hamlet of Upton. A map showing the wards of West Ham Civil Parish as they appeared in 1867. Accordingly, the Public Health Act 1848 was applied to the parish, and a local board of health was formed in 1856. The board had 15 members: 12 elected and 3 nominated by the Commissioners of Sewers. In 1840 the parish was included in the Metropolitan Police District and soon after the built-up area of London had encompassed West Ham and soon after in the London postal district, established in 1857. West Ham was not included in the statutory metropolitan area established in 1855 or the County of London established in 1889. Instead, administrative reform was undertaken in the area in much the same way as a large provincial town. A local board was formed in 1856 under the Public Health Act 1848. In November 1878 the inhabitants of the parish decided to petition the privy council for a charter, incorporating the town as a municipal borough. This was in reaction to proposals to enlarge the area governed by the Metropolitan Board of Works to include adjoining districts with a population of 50,000 or more: the primary aim of incorporation was to prevent the inclusion of West Ham in an enlarged London municipality. This initial application was unsuccessful. However, encouraged by the 1883 incorporation of Croydon, a second petition was submitted in May 1885. Following an inquiry in October 1885, a scheme for the creation of the borough and dissolution of the board of health was made in June and the charter was granted in July 1886. A corporation consisting of a mayor, 12 aldermen and 36 councillors replaced the board, with the first elections held on 1 November. The first mayor was John Meeson, head of a local lime burning and cement making firm, and a former chairman of West Ham Local Board. In 1889 the borough was large enough in terms of population to become a county borough and was outside the area of responsibility of Essex County Council – though still formally within the county. At the time of the 1901 census it was the ninth most populous district in England with a population of 267,308. From 1934 to 1965 it was surrounded by the County Borough of East Ham to the east, the municipal boroughs of Wanstead and Woodford and Leyton to the north, and the metropolitan boroughs of Poplar to the west with the Thames to the south with Greenwich on the far side. The coat of arms was granted by the College of Arms on 14 January 1887. The chevrons on the lower portion represent Stratford, taken from the device of Stratford Langthorne Abbey. At the top right, there are crossed hammers, representing the Thames Ironworks and Shipbuilding Company – the borough's main employer. The ship is representative of the Royal Docks, and the area's long association with the sea. The Latin motto "Deo Confidimus" at the base translates as "In God We Trust." The omission of West Ham from the London-administered metropolitan area, which took in nearby places such as Greenwich and Woolwich, was first commented on in 1855 and West Ham Council later considered the case for inclusion in the County of London in 1895 and 1907. The reluctance to proceed with amalgamation was largely explained by lack of perceived support, fear of financial disadvantage caused by increased rates, the detrimental effect of London planning laws on industry, and the desire to retain the independent civic institutions and privileges attached to county borough status. The Royal Commission on Local Government in Greater London reviewed the local government arrangements of the Greater London Conurbation and in 1965 the county borough, and the County Borough of East Ham, were abolished and their former area was amalgamated with small parts of Barking and Woolwich to form the London Borough of Newham in Greater London. The football club West Ham United F.C. is named after the area. Their nicknames, the Irons and the Hammers derive from their association with the Thames Ironworks and Shipbuilding Company, whose workers formed Thames Ironworks F.C. West Ham United F.C. played at the Boleyn Ground in nearby Upton Park between 1904 and 2016. The West Ham Stadium, a football, greyhound racing and speedway stadium, operated between 1928 and 1972, with a capacity of 120,000. The street names of housing developed on the site of the former stadium pay homage to the speedway greats associated with West Ham, including Bluey Wilkinson and Jack Young. The West Ham Hammers team were involved in the top flight leagues 1929 to 1939, 1946 to 1955 and 1964 to 1971, winning the inaugural British League in 1965. While football is probably the main focus for the community, there is quite a lot of interest in other sports—with rugby being one of them. Next to West Ham station, on Holland Road, is the home of 3 rugby teams, all playing in Essex RFU leagues: Phantoms RFC, King's Cross Steelers and East London RFC. Leon Greene, opera singer and actor. ^ UK Census (2011). "Local Area Report – West Ham 2011 Census Ward (1237320157)". Nomis. Office for National Statistics. Retrieved 18 March 2018. ^ Mills, A.D. (2001). Dictionary of London Place Names. Oxford. ^ a b c d e "The Incorporation of West Ham". The Times. 1 November 1886. p. 12. ^ "No. 24651". The London Gazette. 29 November 1878. p. 6695. ^ "No. 25472". The London Gazette. 22 May 1885. p. 2366. ^ "No. 25596". The London Gazette. 11 June 1886. pp. 2797–2798. ^ "The Incorporation Of West Ham". The Times. 23 June 1886. p. 6. ^ "John Meeson, first Mayor of West Ham, 1886-7". The Newham Story. Newham Council. Retrieved 3 November 2009. ^ "The Newham story, Coat of Arms (3) – West Ham". Newham London. Retrieved 5 March 2013. ^ a b Local administration and public services: Administrative bodies, A History of the County of Essex: Volume 5 (1966), pp. 32–37. Date accessed: 7 December 2007. ^ "US Congress candidate Allan Levene's humble beginnings in West Ham – News". Newham Recorder. 26 February 2012. Retrieved 24 January 2014. ^ Pewsey, Stephen (1996). Stratford, West Ham & The Royal Docks. Sutton Publishing. p. 34. ISBN 0-7509-1417-3. Jim Clifford. West Ham and the River Lea: A Social and Environmental History of London's Industrialized Marshland, 1839-1914. Vancouver. University of British Columbia Press, 2017.